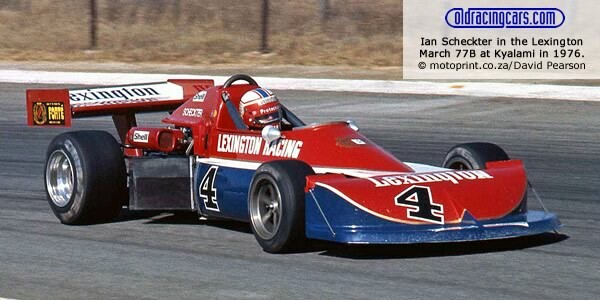 After many seasons of Formula 1, the South African national championship moved to Formula Atlantic for 1976. As the Springbok season started in January, this immediately became an important market for the British constructors to showcase their new cars before the larger US market finalised its buying decisions. This tended to be a March v Chevron battle and March won. In the first two seasons, overseas stars included Bill Brack and Gilles Villeneuve from Canada and Rupert Keegan from England but after Derek Bell's very brief foray in 1978, the series went back to being an entirely domestic affair. The 1978 and 1979 seasons are very curious as the 1978 season ended in May after just eight races and new season began in October. This was due to run through to May 1979 but was later extended to end in December. May 1979 marked the end of normal Formula Atlantic in South Africa as the cars changed to using domestically-produced engines instead of the BDA. The 1976 season: Killarney, Welkom, Aldo Scribante, Roy Hesketh, Brandkop, Kyalami, (Donnybrook), Kyalami, Roy Hesketh, Kyalami, Killarney. The 1977 season: Roy Hesketh, Kyalami, Welkom, Killarney, Aldo Scribante, Brandkop, Kyalami, Donnybrook, Welkom, Roy Hesketh, Kyalami, Killarney. The 1978 season: Killarney, Kyalami, Welkom, Aldo Scribante, Roy Hesketh, Brandkop, Kyalami, Roy Hesketh. The 1978-79 season: Kyalami, Killarney, Welkom, Roy Hesketh, Kyalami, Welkom, Killarney, Roy Hesketh, Kyalami. The South African Formula Atlantic results have been compiled by Chris Townsend primarily using Autosport and Motoring News but also making extensive use of South African newspapers held at the National Newspaper Library Collection of the British Library. From 1978 onwards, coverage of the series in British magazines declined and the results from that point rely more on the archive of material collated by Peter MacIntosh. We are keen to find other sources that cover this period of South African racing. Most of the cars to appear in the championship over the period were from the production lines of March and Chevron with only a couple of Moduses, a Ralt, a Brabham, a couple of Wheatcrofts and a rarely-seen Kauhsen 2J for variety. Surviving production records usually only give the name of the agent but some chassis identities have been worked out by Chris with the help of South African historian Ian Hebblewhite. More help is needed - if you owned one of these cars or raced in the series, or have any material that might help the project, please get in touch. The photographs used on these pages were generously provided by David Pearson whose website www.motoprint.co.za is a fabulous source for South African motor racing images. If you have a programme from any of these races, please check the list of the ones we still need.